More than six years ago the Illinois Association of School Administrators (IASA) began a visioning process to unite the education community behind a long-range plan to improve public education in Illinois. IASA partnered with IASB, the Illinois Principals Association (IPA), the Illinois Association of School Business Officials (Illinois ASBO), the Superintendents’ Commission for the Study of Demographics and Diversity (SCSDD), and the Illinois Association of Regional Superintendents of Schools (IARSS) to create Illinois Vision 20/20, a plan to improve education in the state. The goal was to shape state public education policy with various legislative initiatives focused on four priority pillars: Highly Effective Educators, 21st Century Learning, Shared Accountability, and Equitable and Adequate funding. Since the launch of Vision 20/20 a number of accomplishments have been fulfilled, including the enactment of the Evidence-Based Funding model, a streamlined teacher licensure and recruitment process, the Postsecondary Workforce Readiness Act, further investments in Early Childhood Education, expanded access to technology throughout the state, and increasing the role of practicing educators on the Illinois State Board of Education. With a new governor taking office and a newly sworn-in General Assembly, Illinois Vision 20/20 looks to build upon past successes in 2019. The following updated educational priorities have been assigned to the Vision 20/20 pillars. Recruit and retain high-impact educators by expanding alternative teaching licensure programs and partnerships with higher-education institutions. Provide student loan forgiveness and tiered incentives, as well as development resources, and a comprehensive guide to inform aspiring and prospective teachers in Illinois. Focus on relevant professional development that incudes funding for mentoring of new teachers, allocation of collaboration time, and enhanced professional learning and innovation approaches. Develop the “whole child” by aligning and expanding social and emotional standards, promoting individualized learning, creativity and innovation, and continue development of a state assessment system that produces reliable data but is also balanced, consistent, flexible, and based on realistic timelines. Offer incentives for expansion of early learning opportunities and full-day kindergarten education. Encourage career exploration with increased flexibility in graduation requirements and promote partnerships with business, industry, and post-secondary institutions. Expand technology access that provides high-speed internet connectivity to every school and community. Expand the educator role and responsibility in state governance, monitor the accountability model to ensure it focuses on continuous improvement, recognizes the diversity of struggling schools, and eliminates achievement gaps across the state. The accountability model should allow for local flexibility, promote shared accountability, and be sensitive to local district improvements. Restructure mandates to distinguish between essential and discretionary regulations and ensure local decision making and flexibility. Fund education based on local need and allocate more than the minimum funding level in order to ensure all students have equitable access to high-quality educational programs and safe learning environments. Enhance state spending for additional needs that go beyond the evidence-based funding model, including special education, early childhood, and transportation. Ensure safe schools by providing dedicated funding for the safety of students and allow local districts to determine how to best use these funds. Protect local resources and the stability of local revenue streams. 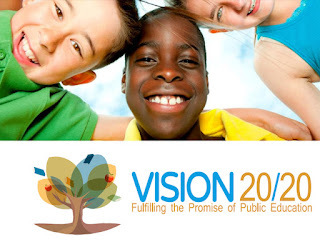 A full list and additional details of the updated Vision 20/20 priorities is available online. For more information about Illinois Vision 20/20 visit their website, https://illinoisvision2020.org/.